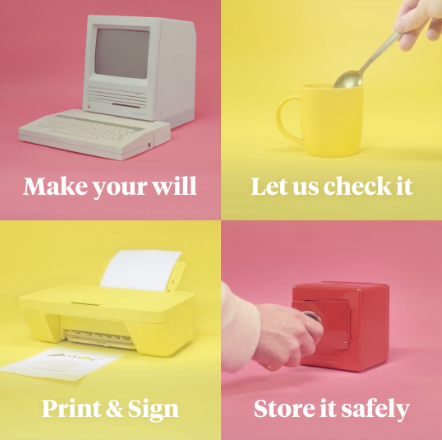 This post explains why you need a will and how to get yours sorted, with zero fuss, today. The number of unmarried, cohabitating couples has more than doubled from 1.5 million in 1996 to 3.3 million in 2017. With so many people in this situation, you might be tempted to assume the law has you covered if one of you dies. The truth is, a vast number of unmarried couples would be left in a mess financially if your partner were to die. The “laws of intestacy” are a set of rules about who inherits what you own if you die without a will. These laws have very different effects if you are or aren’t married. If you ARE NOT married or in a civil partnership then your partner isn’t legally entitled to anything when you die. This is the key point of this post, and not a commonly known fact! Example: Alex and Justin live together in a rented flat and have been partners for 35 years. Alex has £90,000 in savings, and has a £200,000 life insurance policy from his job. Alex has an estranged sister who lives in Australia. Alex dies suddenly without a will. As Alex and Justin were never legally married, the £90,000 and the £200,000 life insurance payout all go to Alex’s closest living relative - his sister in far-flung Australia - leaving Justin with nothing. If you ARE married or in a civil partnership then your partner is entitled to the first £250,000 of what you own, and 50% of what you own above that figure if you have children. Example: Jon and Katherine are married and don’t have any children. Jon has £100,000 in his savings account. Jon unexpectedly dies and hasn’t got round to making his will. In this situation, as he’s married to Katherine, she inherits all of the £100,000. It doesn’t matter how long you’ve been together… how long you’ve lived together… how many kids you’ve had together… if you’re not married or in a civil partnership, you don’t stand to inherit from your partner. What happens to property in the case of unmarried couples? You need to make a will if you’d like your partner to inherit your share. Example: Harry and Cara have been together for 5 years and aren’t married. They own a £450,000 flat together in London, with Harry owning 75% of the property. Harry dies without a will. Due to the laws of intestacy, Harry’s share goes to his parents. Even though Harry wanted the property to go to his partner, his parents are legally entitled to it and force the sale of the flat. Cara has to move out, and doesn’t inherit anything from Harry. Example: Max and Laura have been together for 8 years and are engaged (but not yet married). They own a £300,000 flat together in Newcastle as Joint Tenants. Laura dies before they get married. As Joint Tenants, even though there is no will, Max inherits the entire property. Not sure how you own your property? Check your ownership details or find out more about types of ownership. If your property has an outstanding joint mortgage, your partner will need to reapply for the mortgage in their sole name. If they can’t afford the payments the property will need to be sold. Who inherits if an unmarried couple has children together? If you have children together, are unmarried, and die without a will, then your children will inherit everything that you own. If you’re not married or in a civil partnership, making a will is an essential part of planning for the future. Farewill is an online will maker that gets the job done easily in 15 minutes. We’re the UK’s #1 will-maker, trusted by 7000+ customers. Why not start today, from the comfort of your sofa, in 3 simple steps. Take 15 minutes each to fill in your details and decisions. We’ll do the rest. Our specialists will review your details and approve your will before it’s sent back to you for signing - and peace of mind. Our wills for couples cost £135 in total (£250 less than the average solicitor’s fees). Unlike other online will makers, Farewill offers live support to help you through each step, 7 days a week, 9am-9pm. Unlike other lawyers and will-writers, we only charge £135 for a pair of wills - that’s an average saving of more than £250. Unlike a solicitor, we give you lifetime access to your will, so you can update it whenever life changes.